After earning more than five times its budget on opening weekend, the Blumhouse thriller Happy Death Day will have plenty of competition in its second frame, with the year's most crowded field to date, five new movies opening in wide release. Among the newcomers are Lionsgate's comedy sequel Boo 2! a Madea Halloween, Warner Bros.' disaster thriller Geostorm, Sony's biopic Only the Brave, Universal's The Snowman and PureFlix's Same Kind of Different As Me. 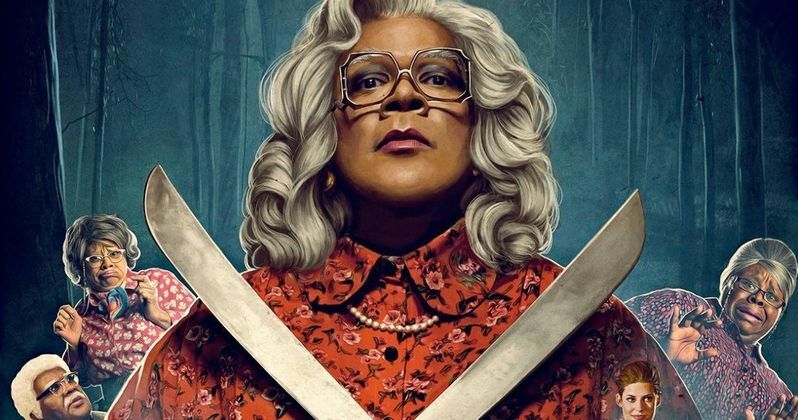 We're projecting that writer-director-star Tyler Perry's sequel Boo 2 will follow in its predecessor's footsteps by taking the top box office spot in a crowded field, with $24.6 million. The third frame in October has traditionally become the most crowded weekend of the year, which started in 2015, when four new movies hit theaters, The Last Witch Hunter, Paranormal Activity: The Ghost Dimension, Rock the Kasbah and Jem and the Holograms, although only the first two movies were able to crack the top 10. The tradition continued last year when four more movies opened and all cracked the box office top 10, lead by Boo! A Madea Halloween ($28.5 million) and followed by Jack Reacher: Never Look Back ($22.8 million), Ouija: Origin of Evil ($14 million) and Keeping Up With the Joneses ($5.4 million). Each weekend was originally set to be even bigger though, with some movies shifting dates at the last minute, and this year is no exception, with The Mountain Between Us moving to October 6 and War With Grandpa moving to February 23, 2018. What was interesting about last year's win for Boo! A Madea Halloween is that it was able to win despite a horrific score on Rotten Tomatoes (21%) and a theater count (2,260) that was roughly 1,500 theaters behind the widest release that weekend, Jack Reacher: Never Look Back (3,780). Boo 2 faces roughly the same daunting task, opening in approximately 2,250 theaters, while Only the Brave is slated to arrive in roughly 2,400 theaters and the disaster thriller Geostorm debuting in more than 3,000 theaters. Universal's The Snowman is slated to arrive in roughly 1,800 theaters and Same Kind of Different As Me will debut in approximately 1,250 theaters. As of now, only The Snowman (24% on Rotten Tomatoes) and Only the Brave (100% on RT) have enough reviews for a TomatoMeter rating on RT. We're predicting that the top 5 will be rounded out by Geostorm in second place with $18.5 million, followed by the true story adaptation Only the Brave in third with $17.2 million, last week's box office winner Happy Death Day dropping to fourth with $14.8 million and Blade Runner 2049 in fifth with $8.7 million. The top 10 will likely be rounded out by The Foreigner ($6.1 million), The Snowman ($5.6 million), Same Kind of Different as Me ($4.2 million), IT ($3.3 million) and The Mountain Between Us ($2.9 million). It will also be quite crowded in limited release as well, with Music Box Films' documentary Aida's Secrets, Freestyle Releasing's drama The Bachelors, The Orchard's foreign film BPM (Beats Per Minute), IFC's documentary Dealt, Reliance Films' foreign movie Golmaal Again, Abramorama's documentary Jane, A24's The Killing of the Sacred Deer, TriCoast Worldwide's horror film Let Her Out, Vertical Entertainment's thrillers Never Here and The Strange Ones, Well Go USA's thriller RV: Resurrected Victims, Gunpowder & Sky's horror-comedy Tragedy Girls, Roadside Attractions' comedy Wonderstruck and The Orchard's documentary The Work. Looking ahead to next weekend, the month of October will come to a close with four more new movies arriving in wide release, Lionsgate's Jigsaw, the eighth entry in the iconic Saw franchise, Universal's Thank You For Your Service, Paramount's Suburbicon and Open Road Films' All I See Is You. Also arriving in limited release, courtesy of Box Office Mojo, is Vertical Entertainment's comedy Crash Pad, Cohen Media Group's drama Daughter of the Nile, Strand's music drama Felicite, Dada Films' drama God's Own Country, Cinedigm's comedy/drama The Heyday of the Insensitive Bastards, Atlas Distribution's drama Let There be Light, Sony Pictures Classics' drama Novitiate and Magnolia's comedy The Square. Take a look at our projections for the box office top 10 for the weekend of October 20, and check back on Sunday for the box office estimates.